Pictured below is just one auto wrapping example of many that the 3M MCS Certified IDWraps.com team designed, printed, and installed for this forward thinking facility. Astro vans haven’t been made for almost 10 years now. 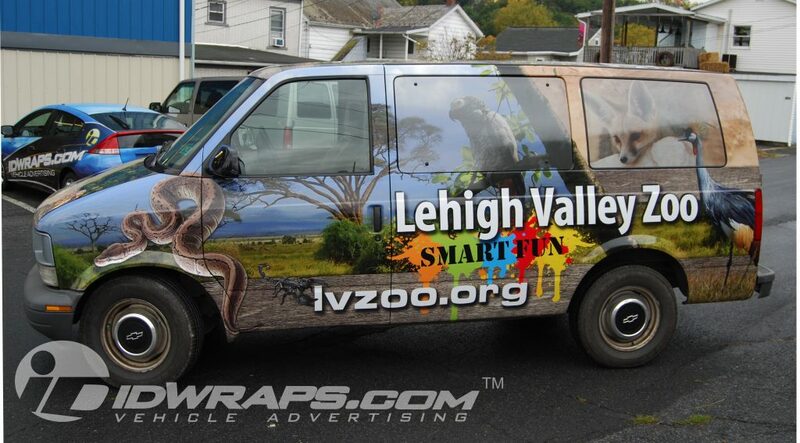 The zoo had this van for some time, and actually had not placed many miles on this vehicle. It did have a few blemishes here and there, as you’d expect of an older vehicle. These issues were easily dealt with by their maintenance staff, since the fixes could simply be done with body filler and quality primer paint. No need for a high end paint repair finish here, as our premium 3M films actually have a grey block out layer in the adhesive. This allows us to wrap over mis-matched paint, existing graphics or lettering, and any other eye sore that may be present. We’ve actually done graphics where there have been many layers of old graphics beneath where they simply disappear beneath the new wrap. It is advisable, however, to remove old graphics which may have dried out prior to installing a new wrap. These old films may be subject to adhesion failure which will take the new graphics into failure right with it. Vehicle wraps are often an excellent solution to aged and unpresentable vehicles. Essentially, the vehicle gets a brand new skin and a second chance at a glamorous life. It is very often that our client’s ancillary staff believe they just got a new vehicle. The fresh new look may be applied to any car, truck, trailer, or any smooth surface in need of a face lift. One thing that surely should not be wrapped over is any rusty surfaces. Wrap films never stick well to rust, so these areas should be addressed by a qualified body shop prior to the installation of an auto wrapping project. Rust also may be characterized as “cancer for metal.” The idea is that rust does continue to propagate over time if not completely removed. In other words- you can’t simply just paint over it and your problem is solved. One other thing to look out for is loose paint. Any peeling or failing paint is likely to cause the wrap to fail as well. Remember, that the wrap sticks to the paint, so if the paint comes off- the wrap will undoubtedly come off with it. One test that the IDWraps.com team uses often is the masking tape test. Healthy conditioned paint should allow for the application of high tack masking tape and then be “snapped up” or removed quickly without any damage to the paint. We very often use the exact same test on drywall surfaces for wall graphics, as these surfaces are very sensitive to damage during an installation. There have been some clients whom have sanded out rust and then painted with aerosol “spray bomb” primers. This has worked for us, and there have been cases where it has not. The risk is surely lowered quite a bit when hiring a professional to do the refinish work. Simply spraying gray Rustoleum paint directly over your rust without removing it first, is certainly a recipe for disaster when installing a wrap. Yes, we’ve seen this plenty of times. Sadly, we have to cancel the install appointment and give the client guidance on proper solutions in these cases. The same goes for vehicles that may have any amount of body work done. With aftermarket paint, there is always a risk of damage to the finish when the auto wrapping is ultimately removed. Unfortunately, aftermarket paint systems rarely bond as well than the factory finish. Most OEM paint applications are done in electrolytic baths where the entire vehicle is dipped into an electrically charged solution, and then painted. If not done on a tremendous scale, it is entirely cost prohibitive for the average local body shop to deploy this type of paint system. Naturally, large vehicle manufacturers enjoy their large scales of economy, so this type of system is surely in the budgets. They very likely save money with these processes over traditional paint systems that your local body guy uses. When using a local body shop for repairs prior to your auto wrapping, be sure they are using quality materials. The best paints are more than just single stage. By stage, I mean there is a quality primer, a color base, and then a clear coat applied over top. It is also critical that epoxy based paints are used. This means that two or more liquids are combined to create the primer and base coat finishes to be applied. Cheaper finishes are generally single stage and do not bond to the vehicle nearly as well as the higher end multi stage finishes. The paint bond is super important when it comes to wrap installation and removal. If it is not biting into the vehicle surfaces well enough, failure could be expected. The bond level is important for the installation phase, as the film is often “tacked” into place as the film is being installed. It is also common practice to pull the film up in small areas as the film is being worked down. If weak paint loosens up and sticks to the wrap adhesive, it is often not repairable. This graphic will likely need to be reprinted, which may add cost to the job for the client. This also causes delays, as our installers are often booked out a few weeks in advance. We’re not always able to squeeze the client’s install back in right away. The bond level is important for the removal phase, since there is a great deal of stress on the paint during removal. Think the removal of a band aid from your arm. Your paint feels the same way when IDWraps.com removes a wrap from your car. Again, weak paint may come off with the wrap which leaves a potentially expensive repainting bill when you’re ready to sell the vehicle. It is undoubtedly hard to sell or trade in a vehicle with peeled paint on its surfaces. The IDWraps.com team is always sure to ask our clients if their vehicle has been repainted prior to accepting any auto wrapping jobs. It is important for them to be aware of the risks associated with aftermarket paint and wraps. If not sure, it is a good idea to have an auto body professional inspect the vehicle for repainting. Most industry veterans can easily spot any paint work that has been done. Our auto wrapping installers may be able to spot this as well, but it is best to go to an auto body expert for this inspection. There have been certainly a few time where we’ve installed wraps where the client did not know that their vehicle had been repainted, and they had us do the wrap anyways. A few have been surprised by paint issues upon wrap removal. In the end, many vehicles are purchased used, and we can’t always depend on the “used car salesman” to be completely honest about any body work that may have been done to the vehicle being sold. The natural inclination is likely: no trust. When purchasing a used vehicle, be sure to ask the salesman or saleswoman to take the test drive past a local body shop for an opinion. Be sure that the dealership is not a client of the body shop, so there may be no collusion. It’s always nice to get a completely neutral opinion. A few dealers we work with often have shared their experiences with us. They said that it is very common for a used vehicle to at least have had the front bumper painted. The bumpers are a the most common area where scuffs and scratches occur, not to mention stone chipping. It is rather economical for a dealership which has an in house body shop to repaint a bumper or two.